What if Steve Ballmer ran Apple? Could Apple gain the whole world without losing its soul? Yesterday, we made Mac owners weep by imagining Steve Jobs in charge of Microsoft – but in best Steve Jobs style, we have One More Thing. If Steve Jobs jumped ship, that'd leave a vacancy at Apple. 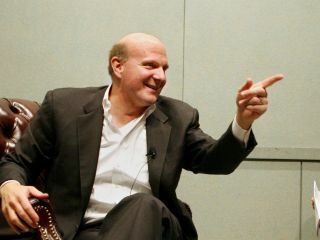 Who better to fill it than Steve Ballmer? Ballmer may be best known online for his infamous Monkey Dance, but he's a smart and shrewd businessman. Without him, Microsoft wouldn't be the giant it is today - and while Microsoft has its problems, it's still bringing in absolutely enormous sums of money. So what could he bring to the world of Macs? Would he be a better CEO than Tim Cook, or would he return Apple to the dark days of the early 1990s? Steve Jobs is a great showman, but there's a formula to what he does: distorted pie chart, tables of figures, one more thing. Has has he ever jumped out of a birthday cake to scare people silly? Ballmer has: in 2000, he hid inside the cake celebrating Microsoft's 25th anniversary. There's no doubting his passion for products, either: in 1991, he shouted "Windows! Windows! Windows!" so enthusiastically that he needed surgery on his vocal cords. Be honest: wouldn't a screaming, cake-escaping man-mountain make an iLife demo much more interesting? "Ballmer is an enterprise guy," says analyst Rob Enderle. "He'd be asking – where's our enterprise stuff? We've got all these PCs out there, but enterprise customers are 70% of the market. Why aren't we there? He'd focus like a laser on servers." If we've learnt one thing from Ballmer's time at Microsoft, it's that he really, really likes dominating markets – and the obvious way to do that with Apple would be to licence OS X to other hardware firms. "He'd say 'every OEM on the planet wants this OS. Let's give it to them for a price and go after the server market – and let's try to dominate it'," Enderle says. "The money isn't really in the hardware business." That sounds strange when Apple's most recent financial results show profits of $1.23 billion on revenues of $8.34 billion, but Apple doesn't operate in the commodity hardware business - and its revenues have been significantly boosted by the iPhone. Apple only targets the highest-end bit of the PC marketplace; if you want the whole PC market then there's more money in the software than there is in the hardware. There's not much margin in a £300 PC, which is why Apple doesn't make them. Microsoft's financial results for the same three month period as Apple show that the client division - Windows - had an operating profit of over $2 billion, the server software division $1.3 billion and the business division $2.8 billion. While Microsoft's overall results were pretty poor, that's largely due to the ongoing losses of the entertainment division and online services divisions - and while the markets in which the profitable divisions operate may be declining, they'll still be cash cows for some time to come. There are two problems with applying the Microsoft model to Apple, though. The first is that Apple would be coming at the enterprise market more or less from scratch (although the Exchange support in the iPhone and Snow Leopard is interesting, and it's panicked Microsoft enough for it to dump Entourage on the Mac and bring out a version of Outlook instead). The second is that it's entirely possible – in fact, it's extremely likely - that the strategy wouldn't work. Apple tried and failed to compete with IBM in the 1980s and early 1990s, and it nearly killed the company. "Ballmer would probably do what John Sculley did – and probably with a similar outcome," Enderle says. By licensing OS X to other firms, Apple would lose the control that ensures Macs "just work" – and its own hardware business would suffer. Looking back on the Sculley era in Triumph of the Nerds, Steve Jobs admitted: "He destroyed everything I'd spent 10 years working for."